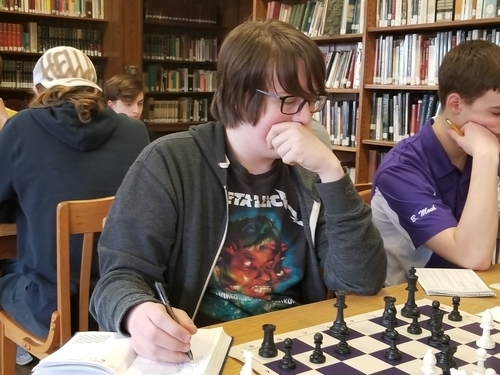 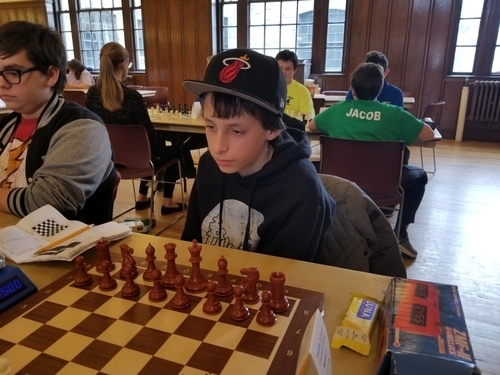 03.21.19 One hundred sixty-eight scholastic chess players competed in the largest State Scholastic Individual Chess Championships in Maine history. 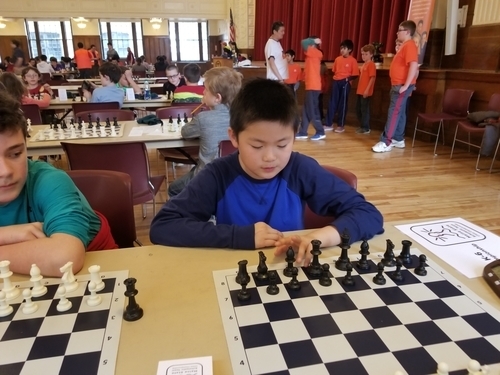 The tournament, which attracted players from accross the state, offered six sections of competition: K-1, K-3, K-6, K-8, K-12 U1200, and K-12 Championship. 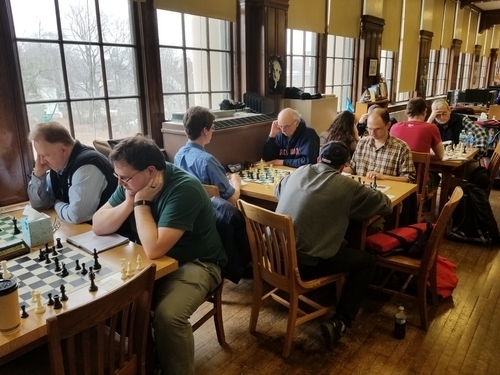 In addition, a twelve-player open event was held concurrently. 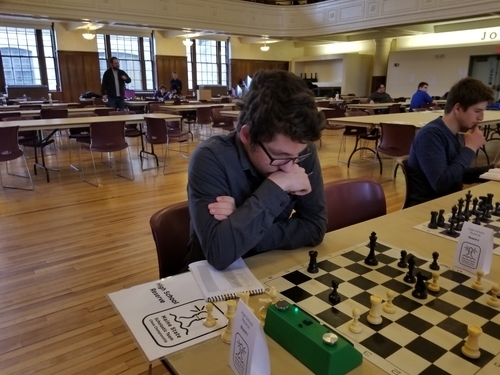 Here's the illustrated tournament report with complete results and US Chess crosstables.. 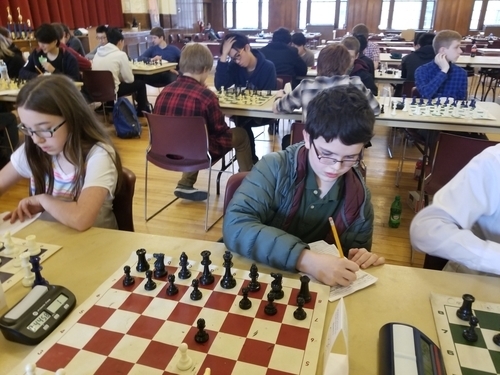 The K-6 Championship section players at 2019 State Scholastic Individual Championships played at John Bapst Memorial High School in Bangor, Maine on Saturday, March 30th. 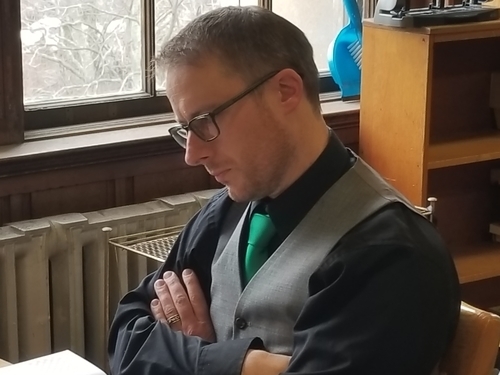 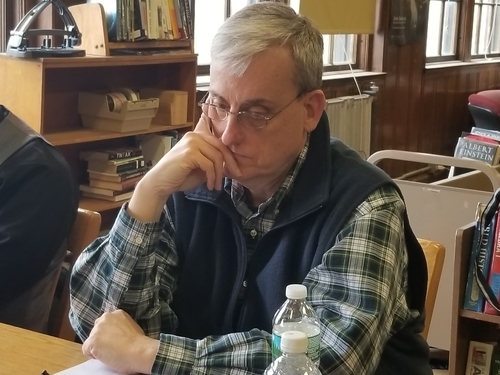 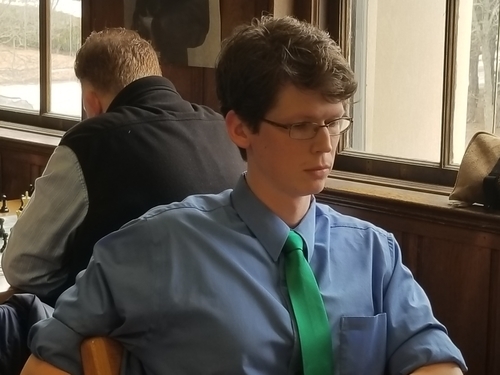 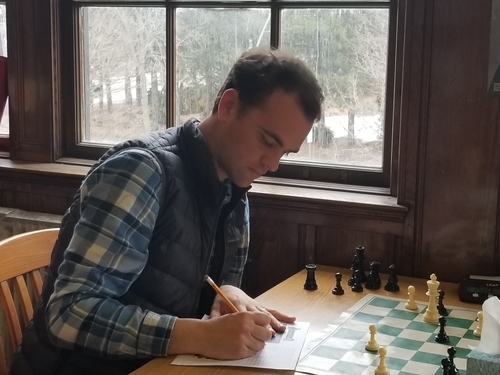 The author and chief tournament director would like to thank the many individuals who helped make this historic event a positive experience for Maine's scholastic chess players. 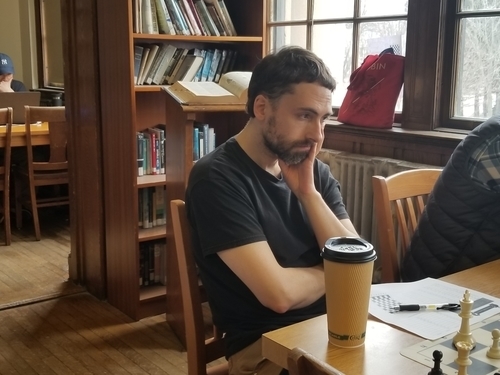 This event would be impossible without the massive cooperative effort of many dedicated folks. 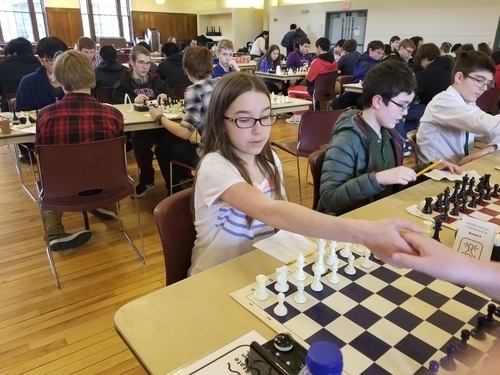 Sincere thanks to members of the Maine Chess Association, the Maine Association of Chess Coaches planning committee, organizers, directors, parents, coaches, volunteers, drivers, and the players themselves. 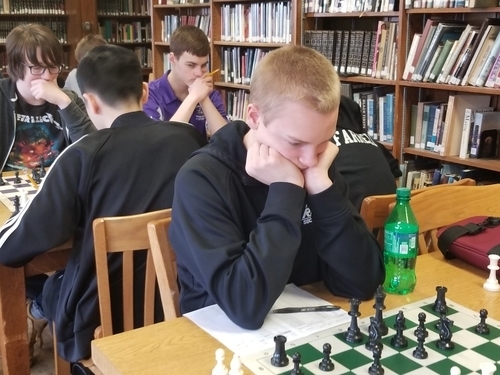 Thanks also to John Bapst Memorial High School and its staff for allowing us access to the facility and tournament rooms and for table and chair set up for players. 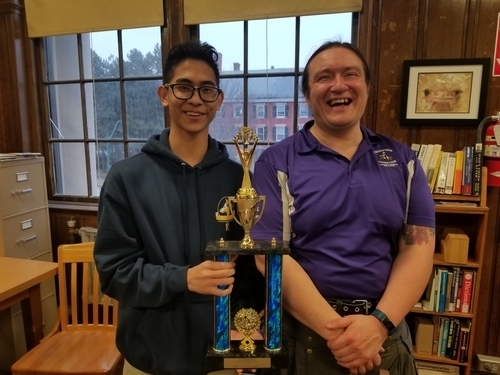 The High School Championship section was won by Bach Nguyen of the Hyde School in Bath, Maine. 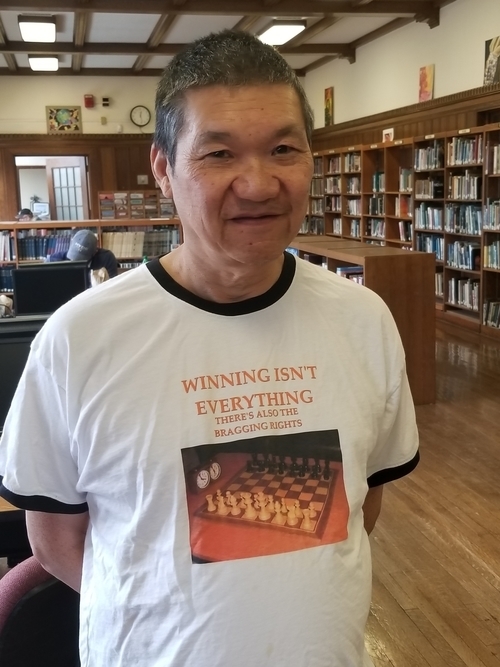 Nguyen put up four consecutive wins without a loss or draw to secure the title. 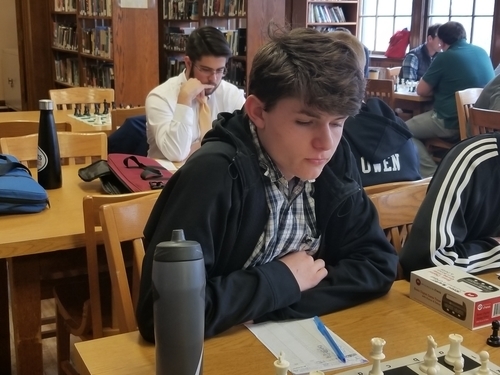 Wyatt Hendrix and Liam Farrell came equal second in the High School Championship section with 3.0 points. 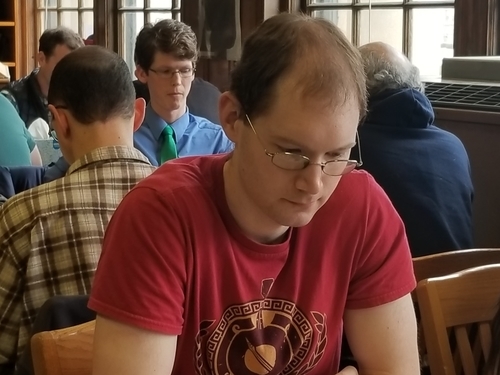 Benjamin Mock and Bill Hartt shared fourth place with 2.5 points apiece. 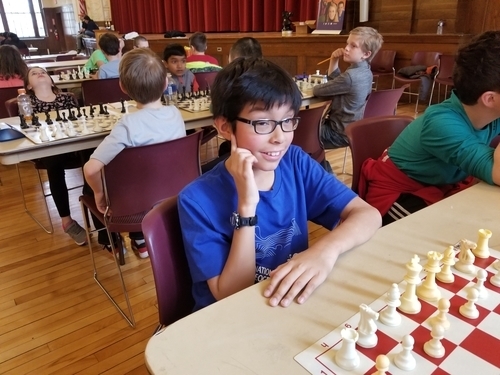 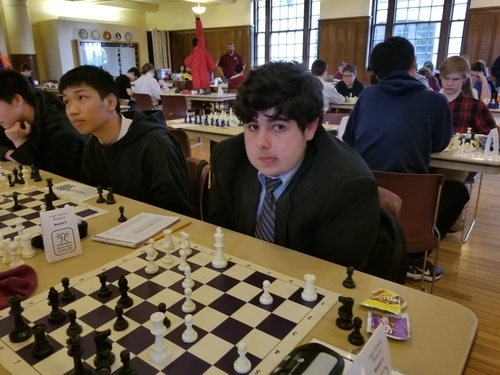 A three-way tie for first place ensued in the High School Under 1200 section between Atticus Foster, Zachary Brislin, and Prince Wang all who scored an unbeaten 3.5 points in four rounds. 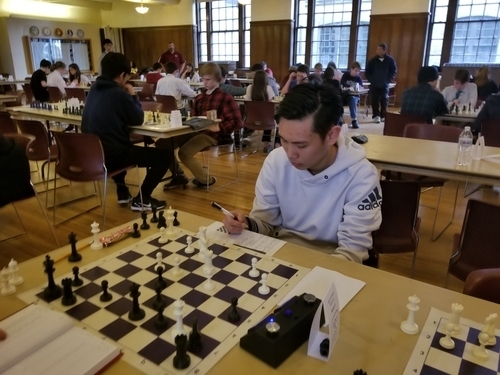 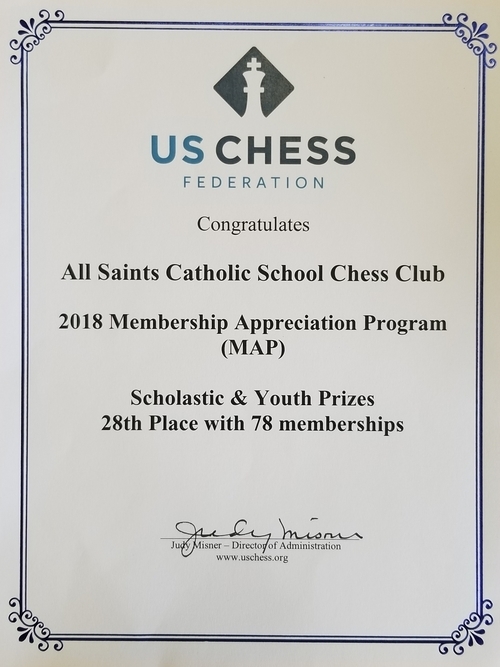 Seven players finished in fourth place with 3.0 points including: Vetri Vel, Ben Penfold, Swaroop Handrel, Devon Hunter, Hung Si Nguyen, Dylan Madden, and Matthew Hutchins. 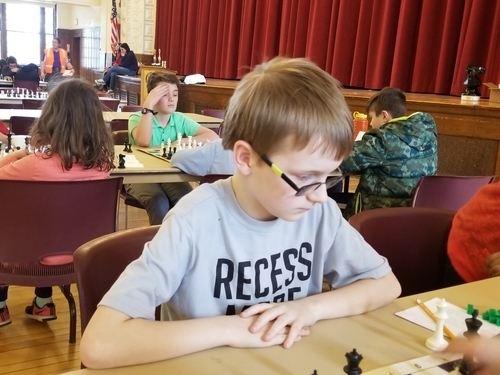 Evan Smith rose to the top of the K-8 Championship crosstable with a perfect 4.0 points in four games. 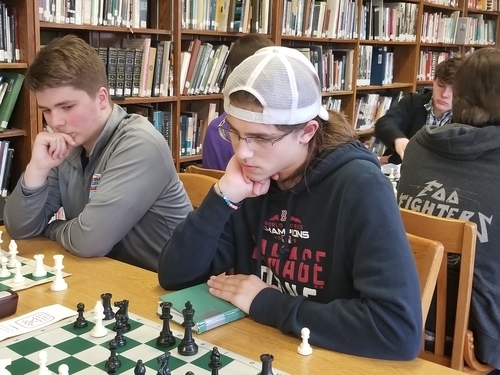 He was closely trailed by Eli Slaughter, Tristan Cousineau, and Tala Bayless all who scored 3.5 points. 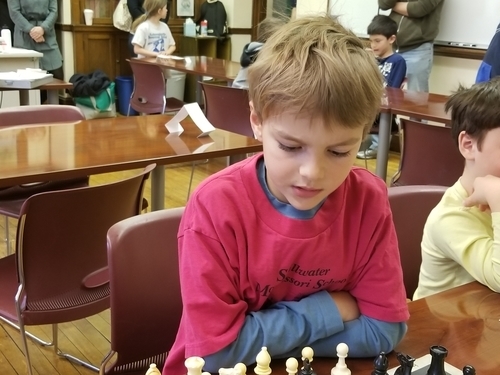 Jacob Klein and Will Hart won the K-6 Championship section with the unbeaten and untied score of 4.0 points. 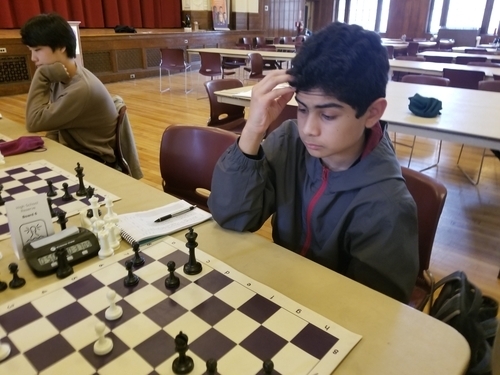 Rohan Joseph took sole third place with 3.5 points. 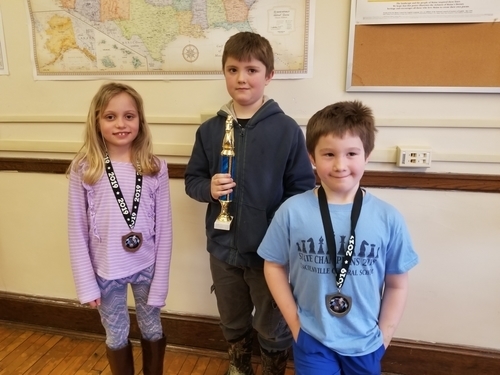 In the K-3 Championship section, Avery Gobin, Jonathan O'Brien, and Avery Adams shared first place with 3.5 points in four games. 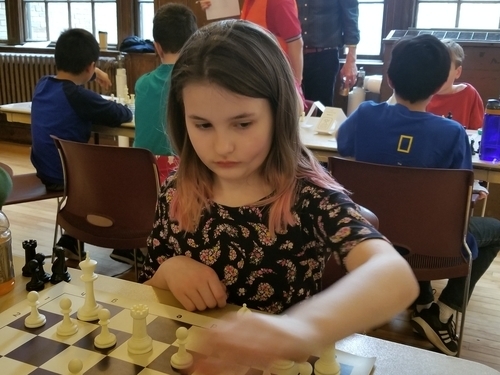 Lily Fishman held on to sole fourth place with 3.0 points. 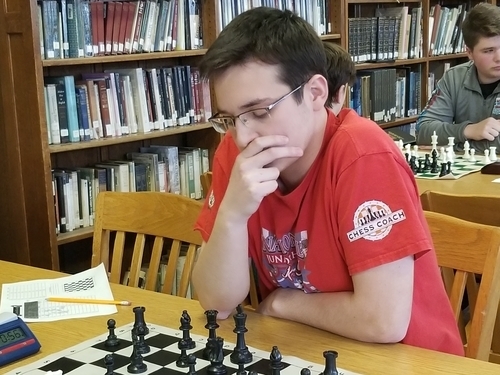 Theodore Seviciu went three and zero to take the Individual K-1 State Championship title. 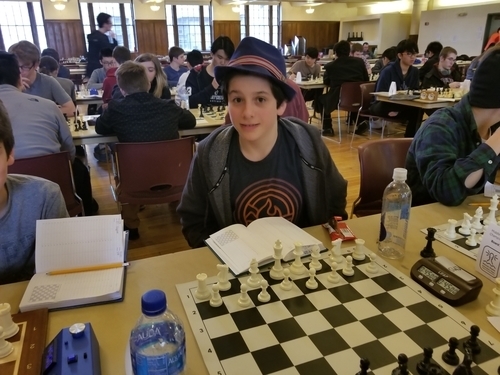 He was trailed by Owen Mitchell with 2.0 points and Eli Polakowski and William Kaplan who tied for third. 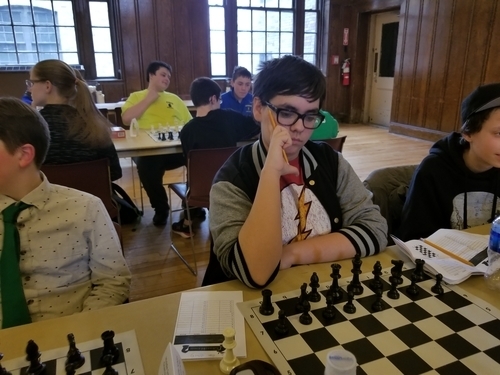 To get involved in the planning and organizing of scholastic chess tournaments in Maine, please watch the ChessMaine.net Events page for upcoming online meetings. 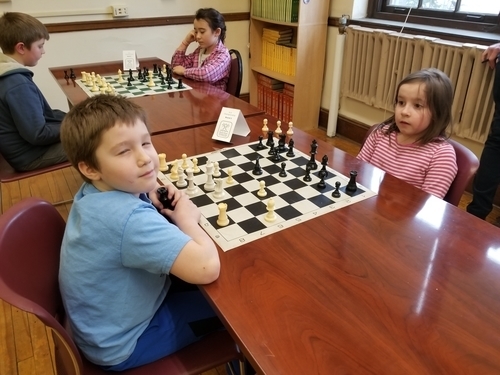 We welcome your participation and input. 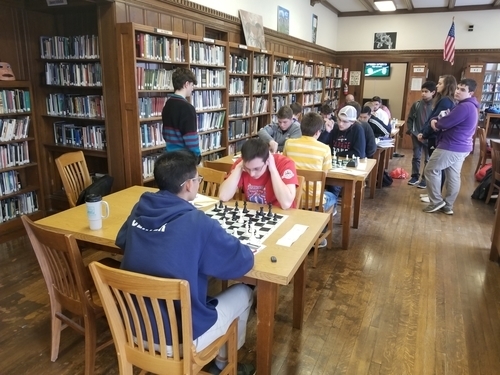 The High School Championship section took place in the library of John Bapst Memorial High School in Bangor, Maine. 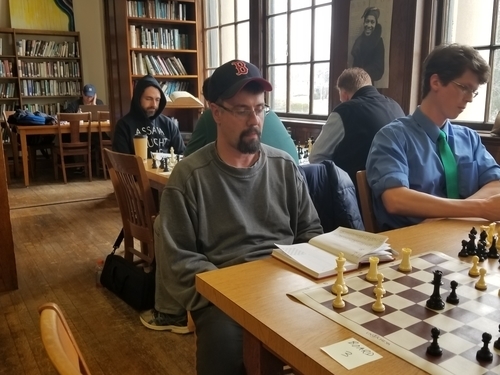 with Maine Chess Association president and tournament organizer Michael Dudley at the prize-giving. 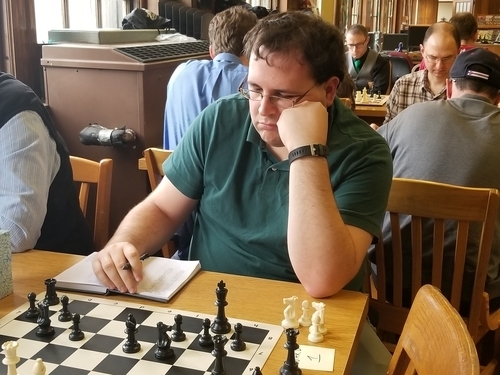 This fascinating third-round game between Ben Mock (left) and Bill Hartt ended in a stalemate draw. 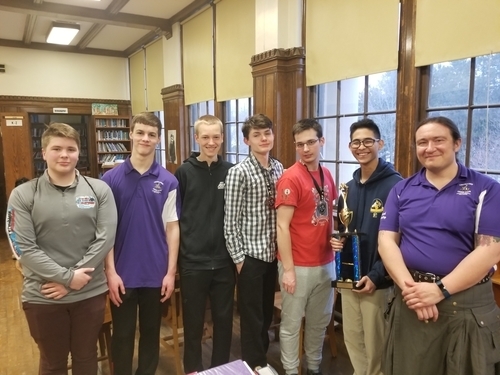 Coincidentally, Mock and Hartt also ended the tournament with the equal score of 2.5 points and shared forth place. 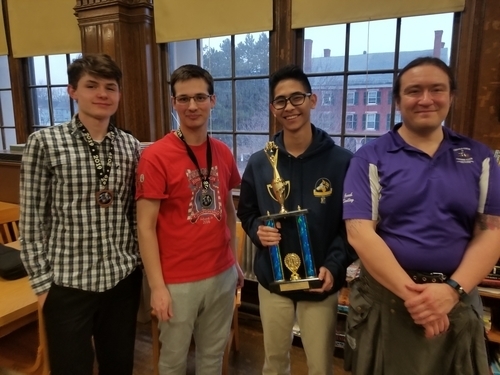 The top three finishers in the High School Championship section (from left) Liam Farrell, Wyatt Hendrix, and Bach Nguyen with tournament director Michael Dudley. 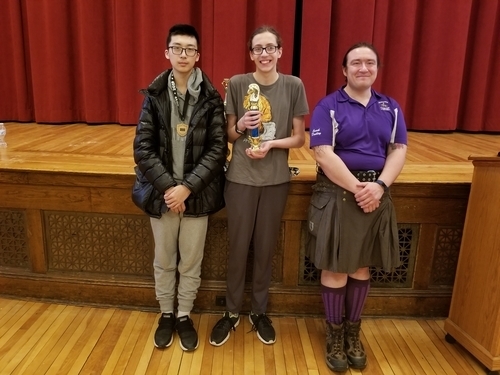 High School Under 1200 section champions (from left) Prince Wang, Atticus Foster, and Zachary Brislin (not pictured), with tournament director Michael Dudley. 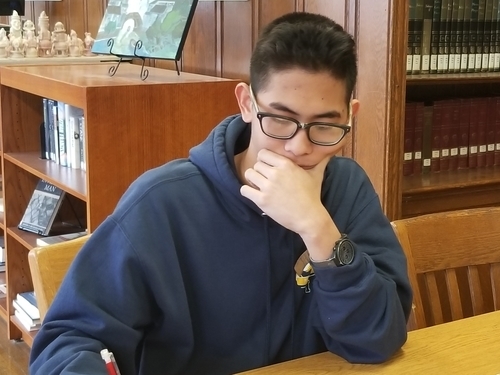 Kevin Nguyen also scored 2.5 points and tied for eleventh place in the High School U1200 section. 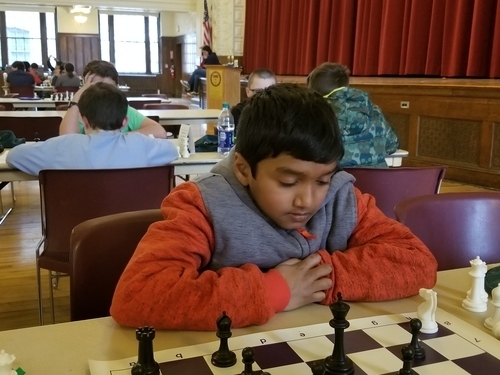 Vetri Vel brings his complete concentration to bear on the position at hand in the High School U1200 section. 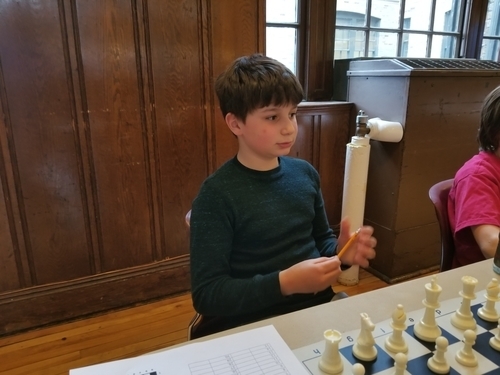 Evan Smith on his way to a perfect score and first place in the K-8 Championship section. 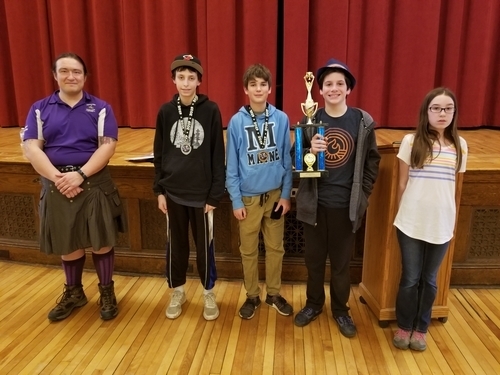 K-8 Championship section winners with tournament director Michael Dudley (from left): Eli Slaughter, Tristan Cousineau, Evan Smith, and Tala Bayless. 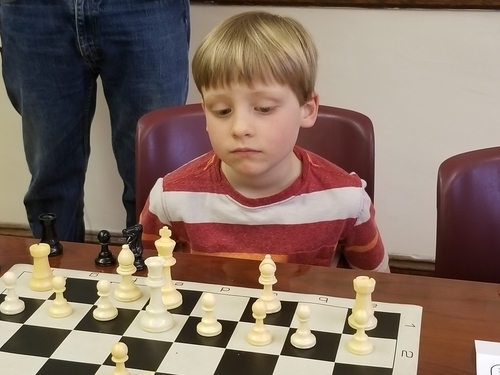 K-6 section Co-Champion Will Hart. 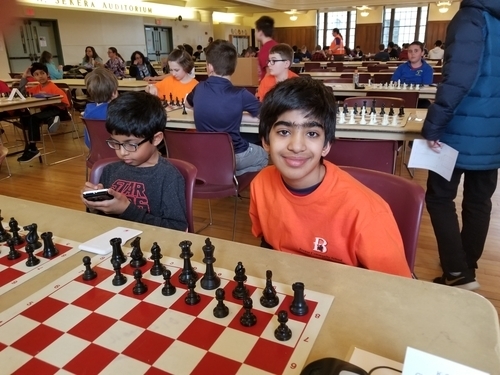 Rohan Joseph finished in sole third place in the K-6 Championship section with 3.5 points. 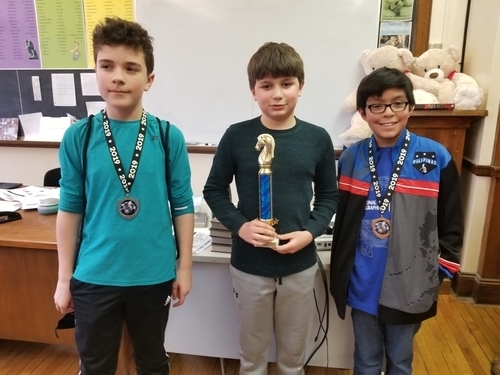 Winners in the K-6 Championship section (from left): Will Hart, Jacob Klein, and Rohan Joseph. 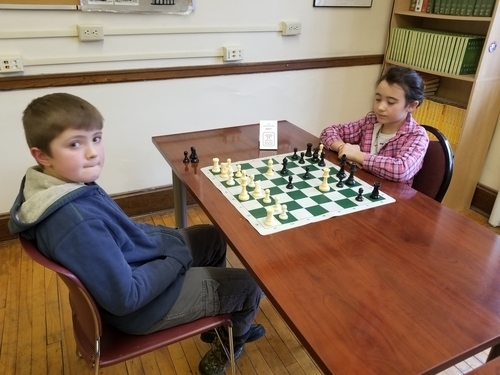 Jonathan O'Brien (left) and Frances Bayless playing on board two in the K-3 Championship section. 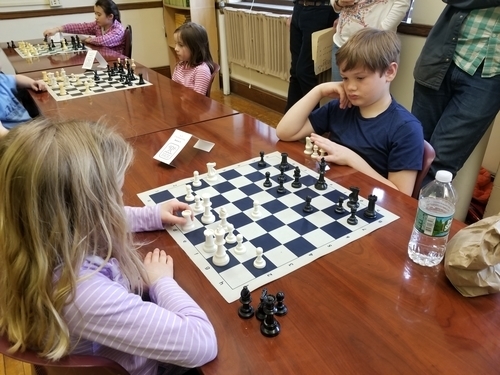 K-3 Individual State Co-Champion Avery Adams (left) makes a move in her game vs Miles Kaplan. 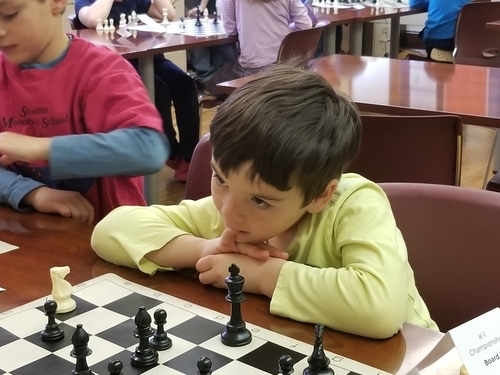 The hooded Joey Pellerin play on board four in the K-3 Championship section vs Victor Clayton. 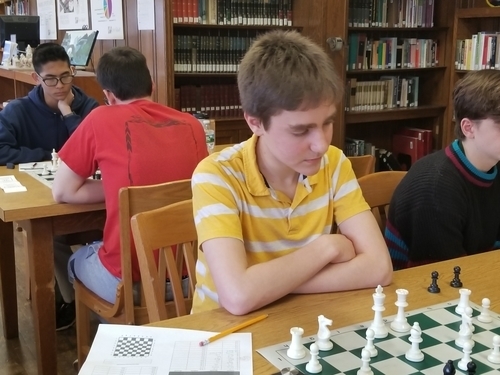 Eli Schaaf (right) considers the position in his third-round game with Ray Beach in the K-3 Championship section. 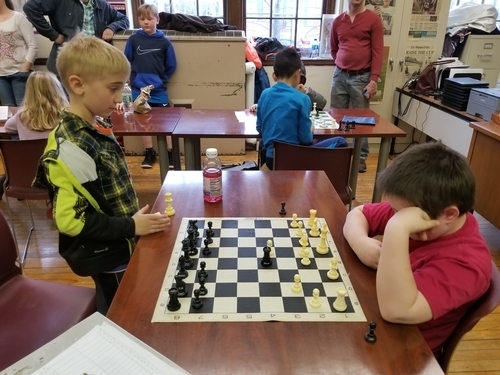 Gabe Lippman (right) plays Hector Clayton in the K-3 Championship section. 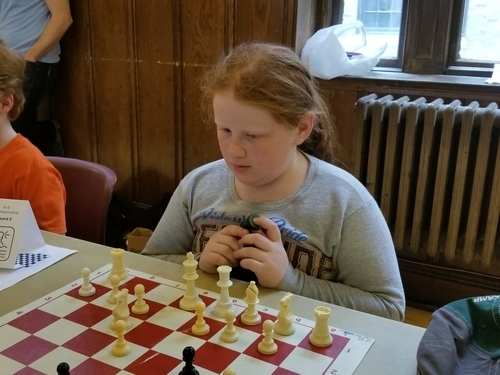 Isabel Pickford plays the white pieces in her game with Andrew O'Brien on board eight in the K-3 Championship section. 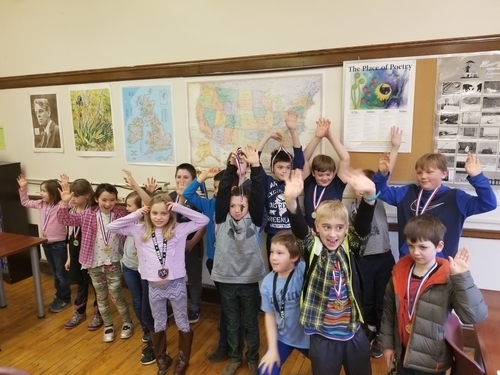 The K-3 Championship section contingent celebrates after the last round. 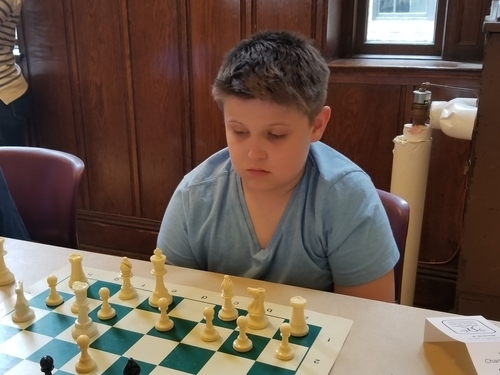 K-1 State Champion Theodore Seviciu of the Stillwater Montessori School in Old Town scored a prfect 3.0 points in three games. 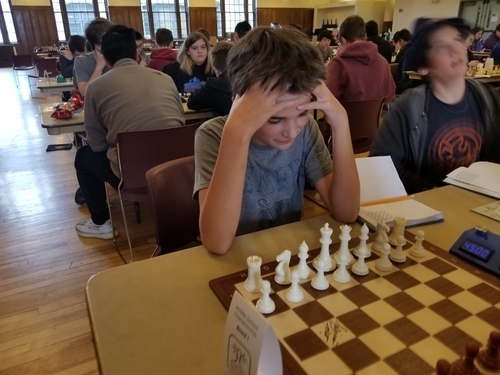 Owen Mitchell finished in second place in the K-1 Championship section. 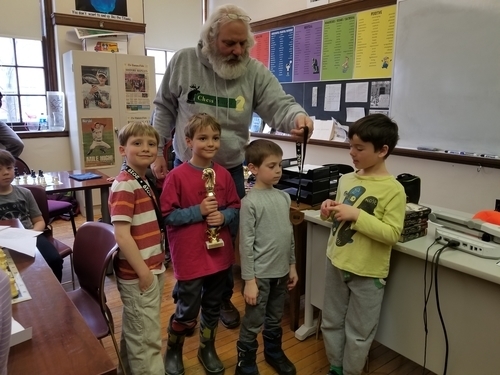 Tournament Director Andy Bryan hands out awards at the K-1 Championship prize-giving. 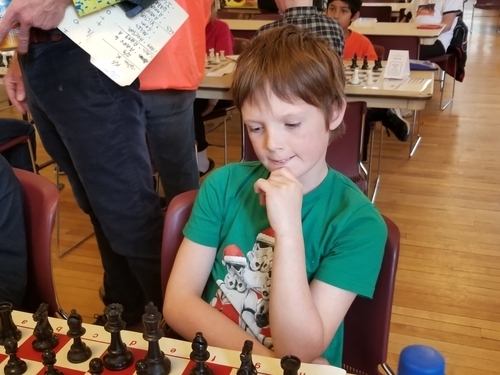 What to do after four grueling games of tournament chess? 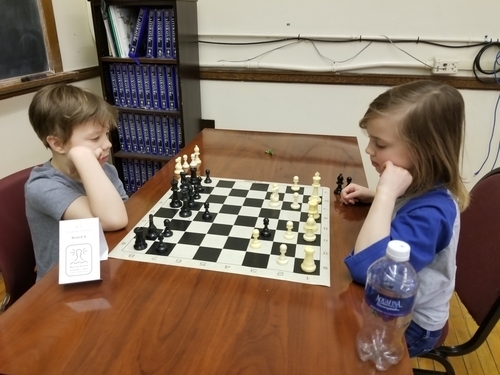 More chess of course! 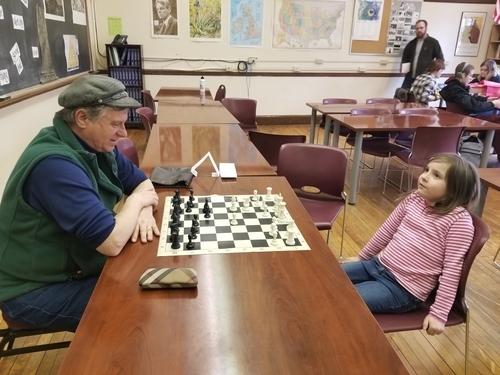 Stillwater Montessori School director and chess coach Joe Alex plays a training game with Francis Bayless. 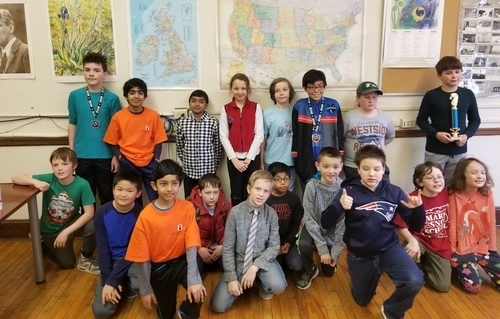 Running concurrently with the scholastic tournament was the Sidekicks--a twelve-player open tournament. 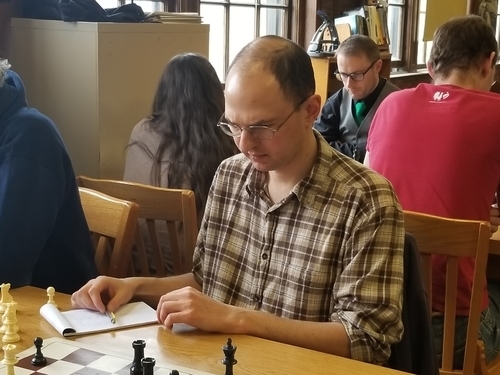 Creator of these incredible hand-made wooden chess trophies Andrew DeMaris. 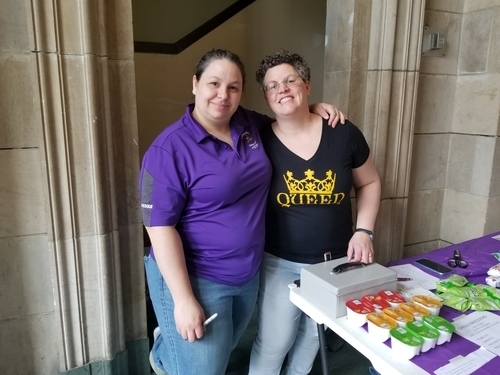 Thanks to our very special volunteers Shannon Levesque (left) and Elisabeth Mock. 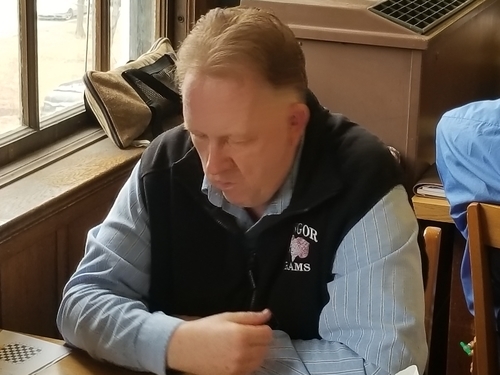 Steve also is a ceramic artist who runs the Creative Arts Center in Brewer. 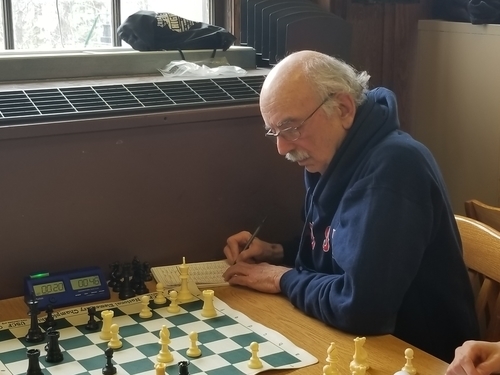 To recognize and thank Maine Chess Association president Michael Dudley for his work to promote chess in Maine, Steve presented Mike with this beautiful hand-made ceramic knight at the opening of the tournament. 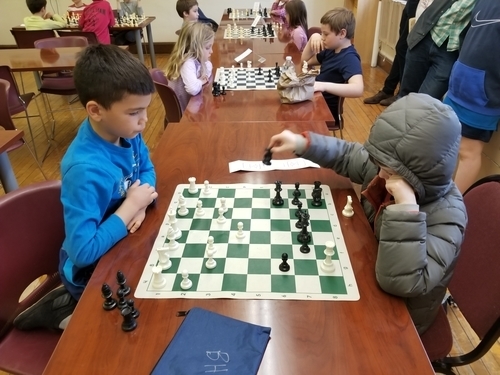 Thanks to Steve, Mike and all who worked tirelessly to make this event a great success!